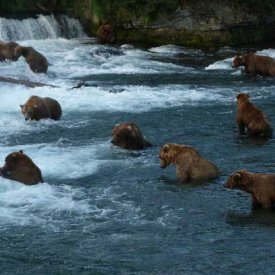 Don’t miss this quintessential Alaskan summer bear tour, full of unforgettable wildlife viewing and incredible scenery. Join us as we visit Brooks Lodge, where we’ll witness the world’s largest brown bears fishing atop waterfalls at the famous salmon run. 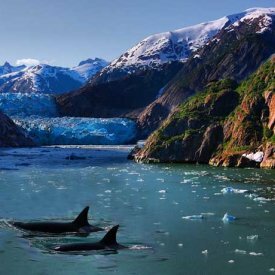 Search for moose, whales, sea otters, puffins, orcas, eagles, sea lions and more throughout the Kenai Peninsula. 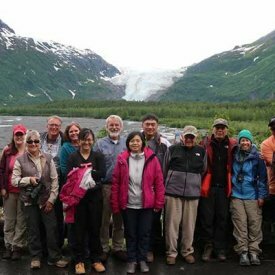 Our small-group, Alaskan guided tour includes time in Anchorage, Katmailand National Park, Seward and Kenai Fjords National Park. We can accommodate all ages and fitness levels — almost anyone can enjoy this trip! Cruise, hike, kayak, drive and fly through some of the most dramatic landscapes on earth. 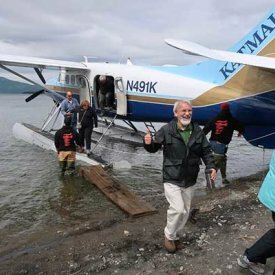 Transportation to and from Brooks Lodge, including a short float-plane ride. All your transportation in Anchorage and the Kenai Peninsula (by private van and car). All your guides (local guides and a Gondwana trip leader). 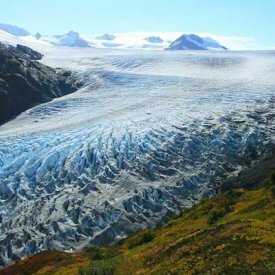 All tours and activities (bear viewing in Katmailand, boat tour in Kenai Fjords National Park, kayaking, hiking tours, a tour of Exit Glacier, the Native Heritage Center plus more…). All breakfasts and four lunches, including an all-you-can-eat Alaskan salmon and prime-rib buffet! Gondwana Ecotours pays for Carbon Offsetting for each guest through donations to reforestation projects. This family owned B&B features views of the Cook Inlet and the Alaska Mountain Range. It is close to the action of downtown Anchorage but tucked away in a peaceful garden setting, just blocks from the beautiful coastal trail. You will love their fresh healthy breakfasts served in the cozy living room warmed by a stone fireplace . Resurrection Lodge is located on Lowell Point, overlooking the bay and the Chugach Mountains. 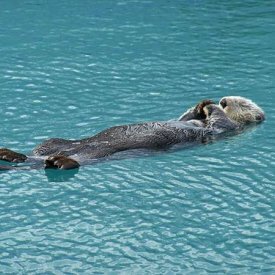 Recharge after a long day in their cozy king-size beds, and relax on their deck to look for wildlife like whales, sea otters, sea lions and eagles soaring overhead. Hotel Alyeska: Nestled in a glacial valley amid stunning mountain scenery, this luxurious resort features an award winning restaurant and a saltwater pool, jacuzzi and spa. Enjoy a scenic tram ride to take in views of the ocean, peaks, glaciers and surrounding wilderness. Brooks Lodge overlooks the world famous Brooks River in the heart of Katmai National Park. The lodge, originally conceived as a fishing camp, began operating in 1950 and is now known as one of the world’s best wildlife destinations. Katmai National Park boasts the largest population of protected brown bears in the world. 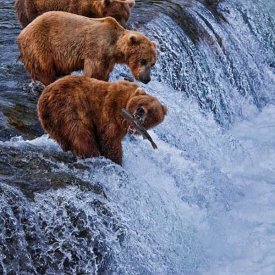 During the summer salmon runs, the Brooks River comes alive with bear activity, providing visitors with unparalleled views of Alaskan brown bears feeding in their natural habitat. Get Ready To Travel to Alaska! * No private rooms available at Brooks Lodge (nights 6 & 7 on the itinerary) due to lodge policy. There will be 3-4 people per room and 4 beds per room. Arriving at Brooks Lodge in Katmailand. The Harding Ice-field in Seward, Alaska. 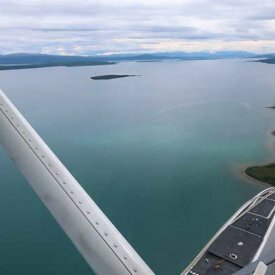 The view from the float plane from King Salmon to Katmailand National Park..
Brown Bears fishing at Brooks Falls in Katmailand! All smiles at Exit glacier in Seward, Alaska.